Evidently, Taipei high school kids are unusually well informed about the going rates for scrap metal. It is too bad there isn’t some sort of Junior Achievement to channel Lefty’s enterprising impulses. Instead, he will hatch a strange shaggy dog heist caper to liquidate a national symbol. 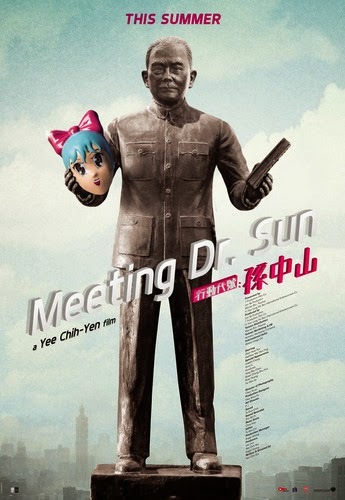 Oddly enough, he will have to contend with a rival high school mastermind in Yee Chih-yen’s Meeting Dr. Sun (trailer here), which screens today during the 2014 Hawaii International Film Festival. The Clifford Odetts-esquely named Lefty and his three friends must constantly evade school bullies because they cannot afford to pay their “fees” for the term. However, Lefty thinks he may have stumbled across the answer to their problems. In a dusty storeroom he spied a cast-off cast-iron statue of Dr. Sun Yat-sen. If they sold it for scrap they could pay off all their dubious dues and then some, without anyone at school missing it. The trick would be transporting the heavy statue, but Lefty is a budding master of logistics. The more pressing challenge will come from Sky, a fellow schoolmate whom Lefty learns is also planning his own statue heist. Lefty soon confronts Sky arguing his desperate financial circumstances should give him first dibs on Dr. Sun. They duly proceed with a “poor-off,” which Sky wins thanks to his abusive and disorderly father. Lefty tries to forge an alliance with Sky, but finds himself double-crossed instead. He might be too trusting, but he is not a quitter, convincing his mates to crash Sky’s job. Meeting is considerably more Stand by Me than The Italian Job, but the extended caper sequence is very cleverly staged. Yee dexterously juggles eight teens in anime masks running amuck and confusing themselves silly. It is a great comedic action centerpiece, but it is embedded in elegantly sad coming of age story. For Yee the hard fact is Lefty and Sky consider their lives predestined by class and see no solutions aside from their unlikely criminal schemes. The young ensemble looks impressively natural on camera, especially Zhan Huai-yun as the earnest and sensitive Lefty. Wei Han-ting counterbalances him well enough as the intense and taciturn Sky, but his slow boil is almost too self-contained and cold blooded for the character’s own good. On the other hand, Joseph Chang and Gina Li offer up some manic but not cringy comic cameos as the school’s security guard and his girlfriend, who will struggle with the competing gangs’ wild improvising. Thanks to the disciplined teen cast, Nick Chou’s nostalgic but supportive piano score, and cinematographer Chen Ta-pu’s dark shadows and warm color palate, Meeting often feels somewhat akin to Kore-eda’s films. It offers some pointed social criticism, but the eccentric caper plot makes it all highly watchable. Thematically and stylistically, it would make a highly compatible double feature with Chang Jung-chi’s even darker Partners in Crime, which also screens during the festival. Recommended for those who enjoy deterministic social dramas with a flair for the absurd, Meeting Dr. Sun screens tonight (11/1) and this Friday (11/7) as part of this year’s HIFF, with subsequent screenings scheduled the following Sunday (11/9) and Tuesday (11/11) during the 2014 San Diego Asian Film Festival.